Welcome back. 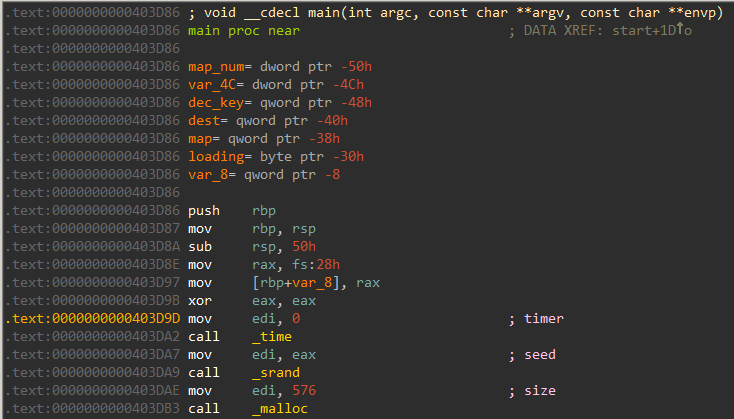 This is the 2nd part of the 4-part write-up for Flareon 4 challenge. If you haven’t read the 1st part, you can find it here. Challenge #5 is an x86_64 ELF although named as .exe. This is similar to those hidden ships game. Running on the terminal a pretty map is printed. There is an 8×8 rectangular grid. Some of the cells have a ship hidden beneath it. 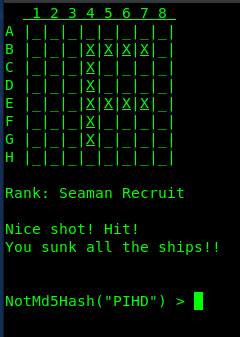 The objective is to uncover all the ships in a limited number of moves. Lets’ try a coordinate say G1. We failed at the first attempt. The map is static, with many more attempts it’s possible to uncover all the ships. When all ships are uncovered, the program prompts for an input – a hash value of sorts. Let’s have a look in IDA. IDA identifies the main function correctly. The program initializes the random number generator via a call to srand . Below that we have a call to malloc requesting 576 bytes of memory. We will see later that these 576 bytes are used for storing the map. 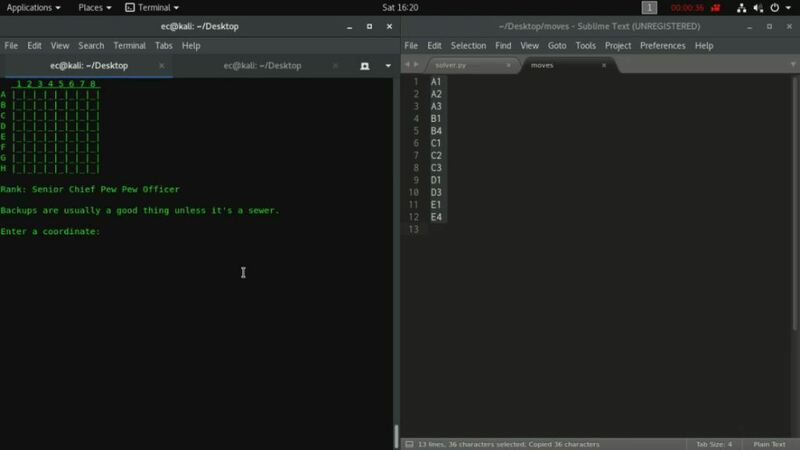 We can use the decompiler for a better understanding of the code. 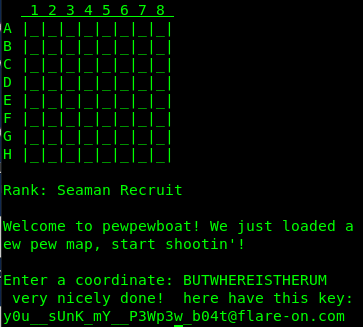 The printf function at line 45 prints the initial “Loading first pew pew map” message. The memcpy call at line 49 copies 576 bytes to the map buffer allocated just before. If we navigate to map_data we can see it is composed of seemingly randomly bytes and probably encrypted. The for loop encompassing the decrypt_map and play_map call indicates that there may be 100 such levels to play, although we will see later this is not the case. Each level is stored encrypted. Since we can perform live debugging on the program there is no need to analyze the decryption routine. We just need to understand how a map is represented in memory. Internally, the map for a level is represented by the following structure. The current and the goal states are stored as bit strings. There are 64 cells. Each cell can have only one of two states. If each cell is represented by a bit a total of 64 bits i.e. a quadword is enough to represent the complete map. We can debug the app for a better understanding. Let’s set a breakpoint before play_map is called to inspect its layout of the map. The pointer to the map is passed in rdi. From the image, we can easily decipher the goal state for level 1 is the first 8-byte block. After taking endianness into consideration it comes out to be 00 08 08 78 08 08 78 00. The rightmost bit (LSB) represents cell A1, whereas the leftmost bit (MSB) represents cell H8. The bits are stored in a row major form. Converting to a binary representation we obtain 00000000 00001000 00001000 01111000 00001000 00001000 01111000 00000000 .Let’s try to have a visual representation of this bit string. We iterate over all of the 64 characters in the bit string and print ‘@’ if it contains 1. 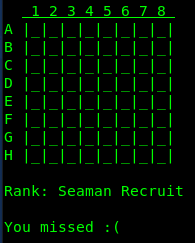 Running the code, we immediately get the position of the ships. Our findings are in line with what we discovered earlier during playing the game. With the above information we can pass the level, however, at the end, the program prompts for a “not md5 hash”. This is more of an annoyance and does not have to do anything with the game. The notmd5hash function is called whenever we complete a level successfully. Inspecting the function which performs this check we can see that our input is compared to an array computed from random numbers. Going by the assumption that there is no way to predict those random numbers I decided to patch out the check. 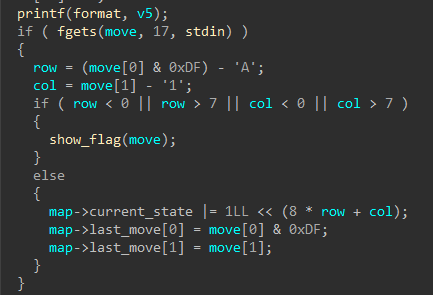 This is simple and can be done by simply inverting the jz instruction to jnz. However, there is an even better way by nopping out the call notmd5hash instruction in the first place. So far so good. We know how the map is stored and can construct the goal state from it. However, there were a lot of levels to play and I didn’t want to enter the coordinates manually. With information obtained from the static analysis I decided to code a semi automated solver using python radare. We need to set a breakpoint on the play_map call at 403EB4 in order to fetch the map passed in rdi and thus the goal state. The script sets breakpoint before play_map is called. When the breakpoint is hit it fetches the goal state and writes it to a file named moves. We can copy the moves and paste them in the terminal to pass the level. A short demo is provided below. After passing all the levels a message is displayed. Aye! You found some letters did ya? To find what you’re looking for, you’ll want to re-order them: 9, 1, 2, 7, 3, 5, 6, 5, 8, 0, 2, 3, 5, 6, 1, 4. Next you let 13 ROT in the sea! THE FINAL SECRET CAN BE FOUND WITH ONLY THE UPPER CASE. If we look back, we can see the position of the ships represented some english alphabet. The first level resembled “F”. The complete list of characters is “F, H, G, U, Z, R, E, J, V, O”. The message wants us to rearrange the letters and ROT-13 the result. Re-ordering the letters gives OHGJURERVFGUREHZ. Performing a ROT-13 on this results in the string BUTWHEREISTHERUM. Co-incidentally the string BUTWHEREISTHERUM is also 16 in length. Restarting the game, and providing this as a coordinate prints the flag. The flag is y0u__sUnK_mY__P3Wp3w_b04t@flare-on.com . Judging from the disassembly, this function should pop out MessageBox when called. However, nothing like that happens when calling this export via rundll32. This is strange. There’s is a exported function but we cannot call it by its name. On loading a dll the first piece of code that gets executed is DllMain . It’s possible that DllMain is modifying the export table so by the time we’re ready to call the exported function named EntryPoint it no longer exists. 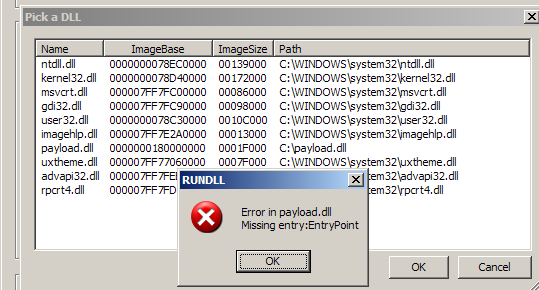 To test the hypothesis, I loaded payload.dll using rundll32 just as instructed. Before dismissing the message box I used Scylla to dump it from memory. Inspecting the export table of the dumped dll confirms our hypothesis. The said export function no longer exists. Instead there is a new name “orphanedirreproducibleconfidences”. The internal name of the dll also has changed to “lustrated.dll”. Lets try to call the new exported function “orphanedirreproducibleconfidences” with rundll32. A message box pops out revealing a part of the key which looks to be the flag. However, this is only just a single letter what about the others. The PE header is normally read-only at run-time. To modify the header the application at some point must make it writable using one of the VirtualProtect functions. Searching for cross references leads us to the location where it makes a call to VirtualProtectEx to make the PE header writable. 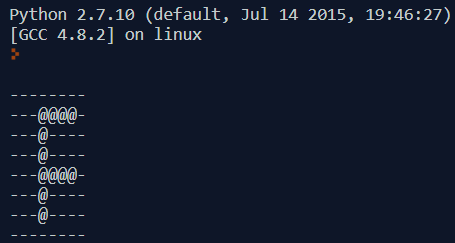 Just below it, func_to_decrypt calculates the value of (year + month) modulo 26. The returned integer in eax is passed to function decrypt . The exported function in the dumped dll takes a different name for each of the 26 possible in (year + month) % 26. To get all the possible names of the exported functions, I wrote a small script in x64dbg. Running this we get the full list of the exported function for every value in (year+month) % 26. The table is given at the end. 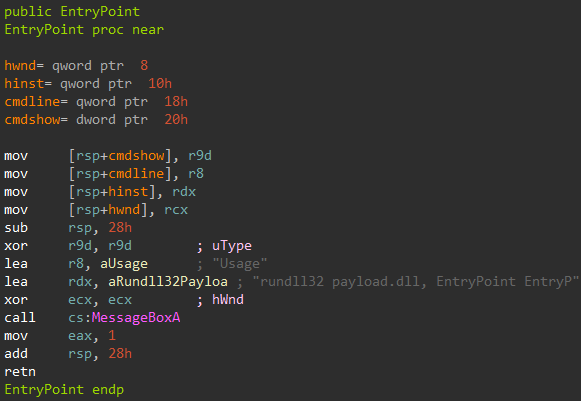 Finally, an ugly batch script to launch rundll32 with the export names. For each of the 26 exported names, a letter of the flag is displayed in the message box. The dll names although provided in the table below had no real use. Combining the characters we get the flag wuuut-exp0rts@flare-on.com . Stay tuned for the rest of the challenge levels walkthrough.